Learn about some answers to the more frequently asked questions we get from our clients. HOW OFTEN DO YOU HAVE TO REFINISH HARDWOOD FLOORS? Nothing adds appeal to your home like a quality hardwood floor. Your hardwood floors can last you your entire lifetime with proper care. 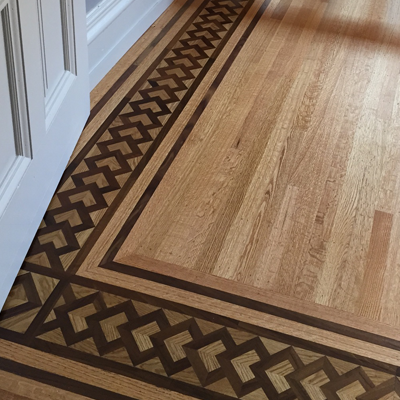 The frequency with which hardwood floors will need to be refinished depends on a number of factors, such as humidity levels, furniture damage, pet activity, how often floors are cleaned of damaging materials such as dirt, and any sustained water damage from leaks, spills, or a weather event. To prolong the look of your hardwood floors, precautions can be taken to ensure they stay looking new. This can include pads under furniture legs to prevent scratching and gouging when moving items around, and mats in front of all outside-leading doors to prevent dirt from being tracked in. A floor that has a quality seal will help in instances of spills or leaks, however, any liquids should be wiped up quickly to prevent any possible damage to your floors. 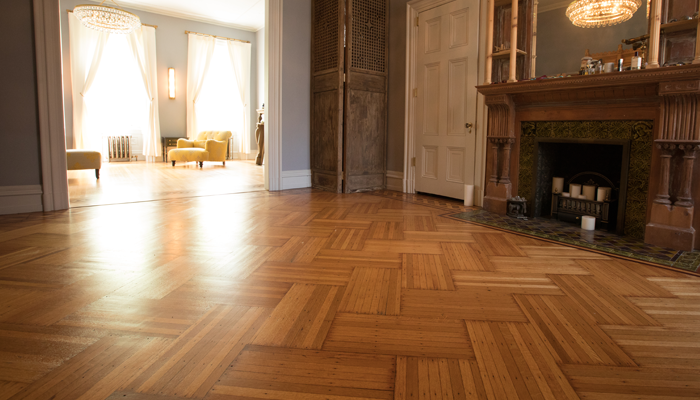 Once your hardwood floors are looking worn, there are a few options for refinishing them. If damage is limited to scratches and general wear, you can opt to have a light sand and refinish using polyurethane. This is a less expensive process and doesn’t require the work of a full refinish. 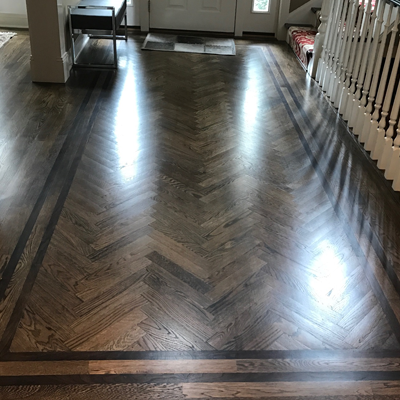 However, if you do have deep scratches or gouges in your floor, water damage, or if your hardwood floors have changed color to a dull grey, a full refinish with a deep sand and finish will be necessary to maintain the look and longevity of your floor. HOW LONG DOES AN ENGINEERED WOOD FLOOR LAST? An engineered wood floor can last anywhere from twenty to one hundred years, depending on the wear and tear on the floor and how well the floors are cared for. Engineered wood floors are a great option for your home, as they look identical to a hardwood floor, are less susceptible to water damage, and cost less than hardwood. Contrary to popular belief, engineered wood floors can be refinished or buffed and polished, depending on their thickness. You can prolong the life of your engineered wood floor by selecting a flooring with a more resilient type of wood, such as hickory. A harder top layer will, naturally, last longer. However, a softer wood with a bolder grain, like maple, will show less wear over time, therefore reducing your need to polish or refinish the floor as time goes on. If your engineered wood floors have lost their shine and the veneer is at least 2mm thick, the floor can handle a full sanding and refinish, just like a hardwood floor. If the veneer on your engineered wood floor is less than 2mm thick, it is best to do a light sanding, or buffing, and then polish the veneer. This costs less than a regular refinishing job and can keep your floors looking great. 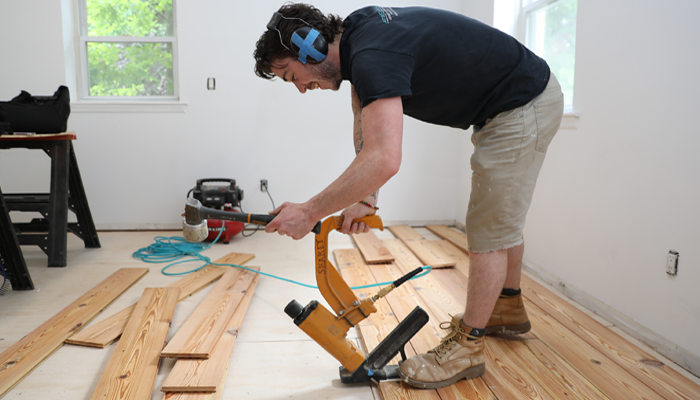 HOW LONG DOES IT TAKE TO FINISH A HARDWOOD FLOOR? When starting a refinishing job on your hardwood floors, it’s important to remember you will not be able to walk on the floors for anywhere from two days to a week, depending on the method you use to refinish, and the finish product that you use. When taking on a basic buff and polish job, expect to be out of your house for at least two days. For a full refinishing job, you will need to plan for anywhere from two to seven days, or up to eight days if you also choose to stain the wood. This also depends on the type of polyurethane finish that you choose. A water-based polyurethane can be done quick, in about two days after sanding. It also dries faster and can usually be walked on within the day. This option does tend to cost more, as more coats are required. An oil-based polyurethane will take anywhere from three to five days to be applied and requires at least twenty-four hours before being walked on, however, this type of finish lasts longer than a water-based polyurethane, making it a more cost-effective option. HOW LONG BEFORE YOU CAN WALK ON A STAINED FLOOR? When choosing to stain your hardwood floors, there are a couple of factors you must keep in mind. Stain cannot be applied over a finished floor, so you must sand down the hardwood first before applying your chosen stain to the wood. This means the staining process will take the same amount of time as a full refinishing job. The stain itself can take up to two days to dry completely, depending on temperature and humidity. After staining, a polyurethane finish must be applied. Staining your hardwood floors will take between three to eight days, depending on the type of polyurethane that you use. A water-based polyurethane will allow you to walk over the newly stained floors within the day of application of the finish. An oil-based polyurethane, while taking three to five days to apply after sanding and staining, will need at least 24 hours to dry. Both of these options still require you use caution when walking over your newly stained floors. Removing your shoes before walking on the wood will prevent damaging the fresh finish. Socks or bare feet are advised for at least a week after staining and finishing, and pets are recommended to be kept off the floors for one to two weeks. HOW LONG DOES IT TAKE FOR HARDWOOD FLOORS TO ACCLIMATE? Acclimating your wood flooring to your house or business before installation is important to ensure your new hardwood does not react improperly once it is already in place. This can include buckling, warping, shrinking or swelling, depending on the humidity and temperature of the space. Acclimating the wood includes monitoring not only the temperature and humidity of the environment, which should ideally be between 60-80 degrees Fahrenheit and between 30-50% humidity but also the moisture content of the wood during the acclimation process. This process typically takes 5-7 days, though the time does vary based on the normal conditions inside the home. The timeline for this process is primarily dependent on the moisture content of the wood you are using when it arrives. A wood with a higher moisture content in a drier climate can take from a week to two weeks depending on the initial difference in moisture. Measuring the moisture content of the wood during the process of acclimation is more important than the actual timetable; if you are not seeing the correct conditioning of the wood over a week, you will need to continue conditioning the wood until it is within the ideal range of moisture. 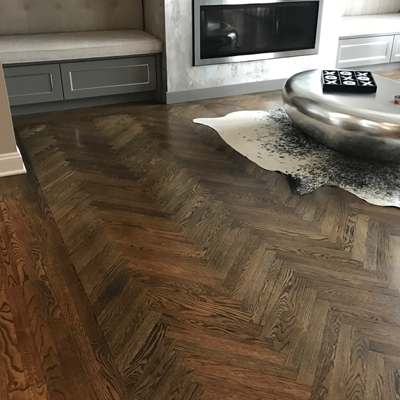 This may require leaving the wood out for an extra week or longer, but it is imperative for the life of your floors that you allow the process to take as long as it needs. DO HARDWOOD FLOORS CHANGE COLOR OVER TIME? 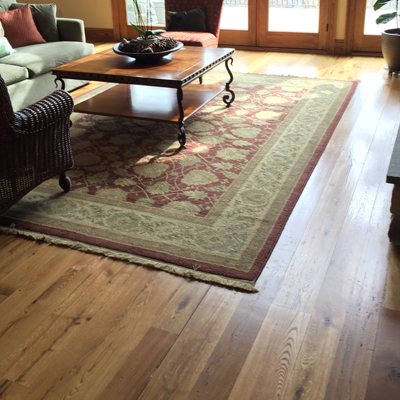 As your hardwood floors age and go through normal wear and tear, you may notice the floors have taken on a new color. This color change, or “patina”, is typical of hardwood floors as they go through oxidation and are exposed to varying amounts of light. This process typically happens in the first year of your floor’s life, with the majority of the change happening within the first three months. Exotic species of wood such as Brazilian cherry tend to experience the most drastic change in color, while domestic woods like oak generally take on a golden or amber color. This is an important factor to consider when choosing a hardwood floor type. Stained floors will maintain their color for a longer period of time, especially with darker woods. 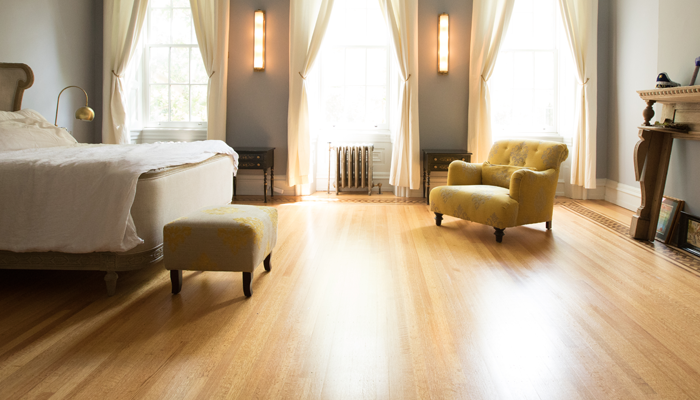 A finish with a UV filter can prolong the development of a patina on your wood floors. You can also make sure that the patina on your flooring develops evenly by regularly adjusting furniture and area rugs, allowing all sections of the floor the same exposure to light. 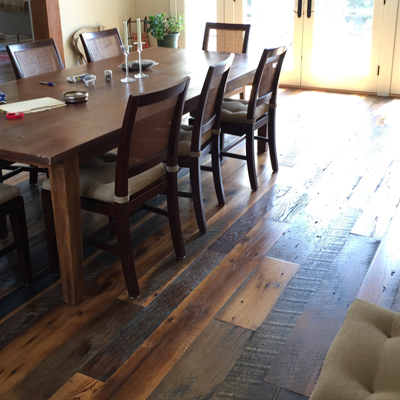 As this process is natural and should be expected, it is important to know what color you want your hardwood floors to be and, ask about how the patina of your wood choice develops over time. This will make sure you will end up with a color that you like from year two on.